All communication patterns are all have certain problems with each other. 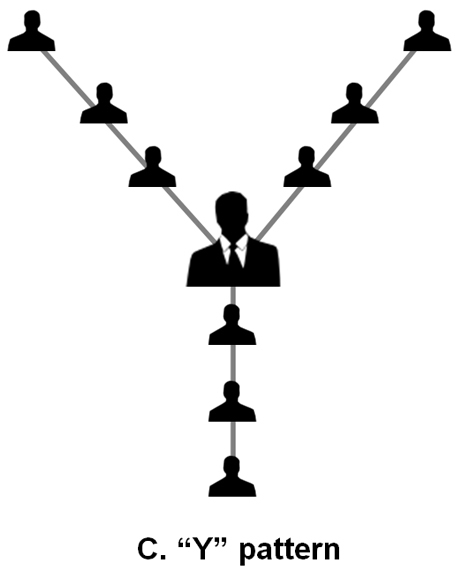 In circle, Chain and Y patterns all group members can’t directly communicate with the group leader. They can communicate to leader only through group members. In Wheel, all the group members can communicate directly with the group leader. 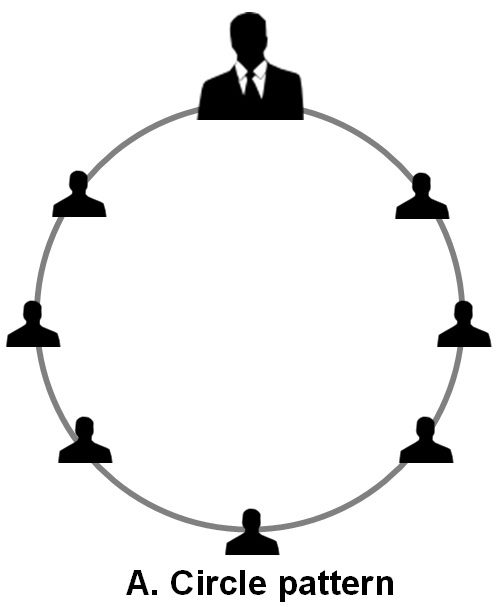 In Circle pattern, the sender (Group Leader) can communicate with the receivers (group members) who presents next to him/her. No others group members can’t receive the sender’s message directly and they receive messages from the other group members who sharing the message from the sender. In this pattern of communication the sender messages travels all over the group through sharing by its members will take time to reach sender again. In Chain pattern, the same problems were appearing as like a circle pattern. The worst part in the pattern is the last member receives the modified messages from the leader. In this case the leader can’t find whether the last member receives the correct information or not because there is no feedback to identify the message distortion. In Y pattern, it’s more complicated pattern and also has the communication problem which appears in both circle and chain pattern. The group is separated into three and the group members can communicate with the other members group through leader only. In Wheel pattern, one of the best pattern while compare to other three. The leader has direct contact with all the group members and there are no communication problems, time issue and feedback from the group members. But all the group members can’t connect with one another. Vivid and well elaborated. Just wish you to add there advantages because demerits are clear from the discussion. How about a Star Pattern? that lesson was wholesome,i liked it! thanks! satisfactory, i liked it, thanks. what exactly is wrong with email address? May I ask some question, when I want to tell something such as local wisdom to another (story telling) what is the most appropriate pattern? very good explanations…good diagrams. Brief and to the point. But what about the network pattern? Very nice. Have enjoyed it. Well elaborated. As a communication student, thus from theoretical point of view, the Wheel Pattern seems to make more sense, as it facilitates the observance of all the major Communication ingredients (Sender, Receiver, Message, Channel and Feedback). But in practice, we tried the same Pattern in our organization (group) but the result was not desirable, because direct contact between the group leader and members of the group requires more skills and team-spirits from the leader (which are mostly lacked). So we end up with dysfunction heads of departments and dictator-like leadership. 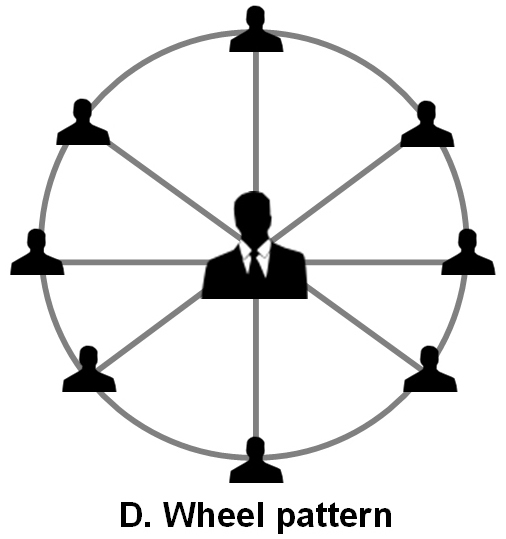 So from experience, i see the effectiveness of Wheel Pattern in small group Communication not in large group. What about things like horizontal, downward and upward communication, are they also communication patterns and if not what could they be? I came across them in some other publication stated as patterns of communication. When we talking about upwards, downwlward and other is communication flow in certain direction. This can be from bottom to top of management or top of management to bottom or whatever. It is different from communication pattern.